This page is about the M41A1 (Japan). For the version in the American tree, see M41A1. The play style of the M41A1 returns to the M24 after the previous medium tank in the line, the M4A3: shoot and scoot. The 'Bulldog' is best utilized as a flanker with its respectable 76mm gun and high speed and maneuverability. 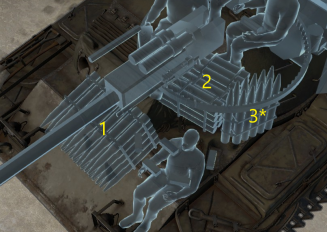 Since the ammunition available is solid shot (no explosive filler), an idea of the internal layouts of the tanks it faces is necessary to make the shots count. 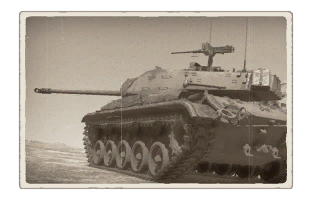 At its current BR, it will regularly face American, British, Russian, and in arcade battles, German heavy tanks, and anything it meets, including self propelled anti-aircraft vehicles will be able to reliable penetrate the M41A1's armour, so utilization of the terrain to maximize cover and good situational awareness is a must. Suspension wheels and tracks are both 15 mm thick. There aren't any specific targets worth noting as the M41A1 will be hurt by pretty much anything. Be extra careful with SPAAs as they can knock out the Walker Bulldog's components with ease and even destroy the tank. If at all possible, try only to expose the turret. 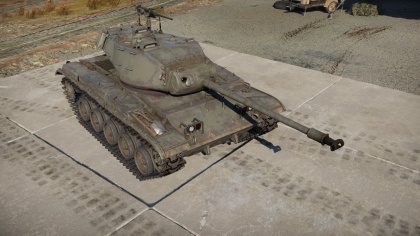 If using the terrain to the M41A1's advantage, it'll usually be able to fire one to three shots, then start moving forwards and backwards, thus making it a lot harder for the enemy to hit the tank. Generally, the M41A1 be able to get in two shots on most targets before they can fire back, and the M41A1 accelerates from 0 to 30 km/h fast enough to become a hard target to hit if only the turret is exposed! Like the tanks that come before it, the Bulldog should be used as a rapid-deployment support vehicle in conjunction with heavier vehicles. It is best used to run rapid insertion and flanking operations while allowing the heavier tanks absorb the brunt of the enemy attack. The Bulldog's top speed does cap off-road, requiring good knowledge of the map to make the most of the terrain. Always remember that the Bulldog lacks any effective armour. In a frontal attack, it will be easily penetrated by almost anything the enemy throws at it. Try to use the terrain to hide the tank and relocate after shots. Also, attempt to engage targets who are busy or already engaged with a teammates. The Bulldog's 76 mm gun has great penetration, but due to the solid shot AP rounds it has it is necessary to make each shot count by hitting either ammo racks or fuel tanks/engines to disable and or destroy an enemy vehicle. Equipping HVAP rounds later on makes it easier to destroy vehicles with better side armour such as the IS-3 which has a fairly strong side profile. The Bulldog is best playing a mobile role; trail the outskirts of the map and take shots at the enemy from a distance and keep relocating. Don't stand still for too long as one or two hits are usually enough to completely disable the tank. While playing this tank, the biggest concern should be not to get hit by anything. Given its thin armour, anything that the Bulldog is facing will be able to deal heavy damage. In summary, the Bulldog is a very maneuverable tank and with practice is a very potent threat to enemies. If up against heavy tanks, such as the Tiger II H, don't bother trying to hit its front chassis armour even with APDS. The chances to penetrate this tank's upper glacis are very low. It is better to try and either ignoring him or aiming for his lower glacis and turret. Should the round penetrate the lower glacis, the transmission is likely to catch on fire. When attacking the turret, aim for the gunner on the left (player's right) of the gun. After that, disengage as the gunner will be replaced faster than the M41A1 can reload. Fighting off heavily armoured targets takes a lot of practice, but the gun's accuracy and good penetration can be used to the M41A1's advantage. The U.S. Army light tank in the later part of World War II, the M24 Chaffee, was a promising design but was deemed not effective for the future of armour encounters. Though its role as a scout was seen as needing the 75 mm gun, the army wanted a tank with a better gun to have a more equal chance against tanks. The project began as the T37 program in 1947 with the focus of being air-transportable with an anti-tank capability in the form of a 76 mm gun and a rangefinder. The adoption of a simplified rangefinder had the project designation changed to the T41. After testings and evaluations, the T41 model was accepted into service as the M41 Little Bulldog, with production starting at Cadillac Cleveland Tank Plant in 1951. The name "Little Bulldog" stayed until General Walton Walker, the first commander of the 8th US Army in Korea, died in a car accident, so the tank was renamed into the M41 Walker Bulldog in remembrance. Production went from 1953 to somewhere in the late 1960s with about 3,728 units produced. The M41 light tank would go on to replace the M24 Chaffees by 1953. The M41 had a crew of four, commander, gunner, loader, and driver. The tank had a profile of under 9 feet and 19 feet long. The tank was lightweight at 23.5 tons and thus had rather thin armour, with the front armour only 25.4 mm thick (sloped at 60 degrees for about 50 mm effective). However, the tank was very agile with its torsion bar suspension and Continental AOS 895-3 series 6-cylinder gasoline engine of 500 hp which could deliver a road speed of 45 mph with a 100 miles operating range. Unfortunately, the tank was criticized for being noisy, a fuel-guzzler, rather heavy, and the American crewman found the Bulldog interior to be quite cramped. Despite that, it delivered speed, firepower, and reliability in a light tank format. Several upgrades were made on the M41 with better technology, the M41A1 had a hydraulic turret traverse with more ammo storage, the M41A2 had a new fuel system, and the M41A3 are old M41A1 tanks with the new fuel system from the M41A2. In 1961, the United States gave 150 M41 Walker Bulldog tanks to the Japanese Self Defense Force to supplement their new and heavier Type 61 main battle tank. These would see service all the way until 1981. This page was last edited on 19 March 2019, at 19:07.